IMGInternational Commerce Co, sells used container chassis and other intermodal equipment to customers located in USA or overseas customers. We maintain a big inventory of container chassis in our yard in Miami Florida and in our yard in Laredo Texas, we also carry a big inventory nationwide. We commit ourselves to move and ship the equipment, so it will arrive to the port of destination on time and in excellent condition. Overseas customers are always concerned, how chassis or trailers will be moved from my yards in USA to the Shipping Port in USA or to the final destination Port, it is a delicate task that requires experience. We are experts in this area, we have been in business for a long time, so have qualified logistic companies working for us. 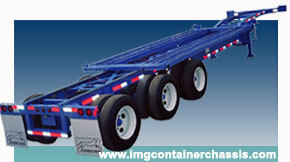 We will select the most economical way to move the chassis or trailers you have purchased from us. Chassis or trailers will be moved either over the road, by train, vessel or with a combined system (Intermodal). We will find always the most competitive inland freight and ocean freight before quoting you the equipment you need. As a result, it will bring you cost savings in the importation’s total expenses. IMG International Commerce Co. is serving customers located in USA and all over the world, we export chassis to Dominican Republic, Puerto Rico, Bahamas, all Caribbean Islands, Mexico, Costa Rica, Guatemala, Honduras, Nicaragua, Panama, Venezuela, Colombia, Ecuador, Peru, Chile, Bolivia, Uruguay, Paraguay, Angola, Nigeria, Cotte D’Ivory, Kenya, Rusia, Canada, Cambodia, etc. We would like to have you as our customer.